Learn how eating breakfast will get you through the day with more energy and can help prevent those feelings of hitting a slump. Have you ever hit a mid-morning slump? Maybe you find yourself reaching for that second (or third) cup of coffee to give you a jolt. Or you try to ignore the rumbling in your stomach that is causing you to lose your concentration. Even if you ate breakfast this morning, it may not have been the best breakfast for your brain and body. What does eating breakfast do to my hunger throughout the day? Eating a nutritious breakfast jumpstarts your metabolism and is associated with lower body weight. 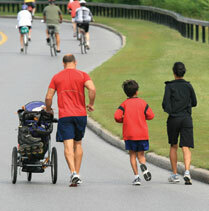 What a perfect way for parents to start the day! With fast-paced mornings, it is easy to grab something quick that is likely to be packed with sugar and fat. While this might be a simple fix to hold off hunger, it’s not necessarily the most nutritious choice. What should I focus on at breakfast? The best breakfasts are those that are packed with a healthy combination of protein, fiber and nutrients from fruit, whole grains, and calcium-rich foods that will not only aid in keeping you focused throughout the morning but also prevent hunger from striking well before lunch. What are healthy options for me to eat? Prevent such a mid-morning meltdown from happening by keeping the cabinets and refrigerator stocked with quick and healthy breakfast choices. You may find that your kids are calling for these creative breakfasts too when they see how fun and flavorful they are. Do your whole family a favor by being breakfast-ready with these delicious ideas that will satisfy everyone. Peanut buttery banana roll-up: Spread peanut butter on a whole grain tortilla, top with banana slices and roll up. Fruit smoothie: Smoothies are a great way to include fruit in your breakfast. Using a blender, mix fresh or frozen fruit. Add milk or yogurt for added protein and calcium, and toss in some ground flax seeds for brain-boosting omega-3 fats. Melon, cereal, and cottage cheese: Melon wedges make a great base for a protein-packed scoop of low-fat cottage cheese (or yogurt). Top this with crunchy whole grain cereal for a fun and fruity breakfast that is heaping with nutrients. 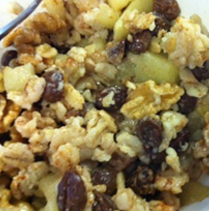 Trail mix oatmeal: Start with old-fashioned oatmeal, then add in crushed nuts and dried fruit for a trail-mix twist. Cook your oatmeal with fat-free milk for an added calcium and protein punch. The heart-healthy fat from nuts and fiber from the oatmeal will be satisfying and delicious. Keeping small snacks on hand in case you just can’t make it until lunch will prevent you from grabbing a sugary snack mid-morning. Try whole grain crackers, a nutritious granola bar, or fresh fruits and vegetables. Make that morning slump history. By filling your body with nutritious foods first thing in the morning, you’re also fueling your brain. Check out these 10 yummy breakfast ideas your kids will love and hot healthy breakfast ideas to start off your day!